ASIA/LEBANON - President Aoun: Lebanese reality should not be perceived in terms of "majority" and "minority"
Beirut (Agenzia Fides) - It is wrong to persist in interpreting the Lebanese ethnic and religious reality according to the categories of "majority" and minority": this custom has ended up depriving some members of Lebanese society "of their political rights and access to public offices". Lebanese President Michel Aoun recognized this, referring in particular to the Lebanese Christians who belong to Churches and ecclesial communities other than the Maronite one. 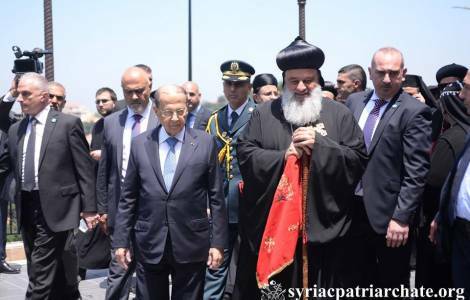 The invitation to overcome the concepts of minority and majority and to recognize the plural and at the same time unitary character of the Lebanese society, was expressed by President Aoun on the occasion of the Mass celebrated on Friday 22 June by Syrian Orthodox Patriarch Mar Ignatios Aphrem II, in the context of the events organized for the inauguration of the new seat of the Syrian Orthodox Patriarchate in Atchaneh, in the Land of the Cedars. Lebanon - reiterated Lebanese Head of State in his speech - has been, since the dawn of history, a land reached by "peoples and religious groups fleeing persecution in search of refuge". A destiny that has often united Christians belonging to different theological and liturgical traditions. "Eastern Christians" remarked Aoun "are not intruders on this earth. On the contrary, it is from here that the evangelization of the whole world began". After the massacres and persecutions suffered in the past - continued the Lebanese President "even today, Eastern Christians continue to be victims of violence. Many of them have moved away from their homeland. A human hemorrhage that must cease".